It sort of shocks me that we might still be discovering planets in our own neighborhood, but I guess that's because I don't really appreciate how very large our own neighborhood is (even if it's tiny). Out in the Oort Cloud*, which is something I always have to look up but seems to be where comets live when they're not commuting in to destroy the earth, there may lurk a behemoth planet four times as massive as Jupiter. They suspect some large planet is out there because comets aren't coming out of the cloud at the predicted angles, something they think could be explained by the presence of a hitherto-unknown mass kaffoodling with their trajectories. 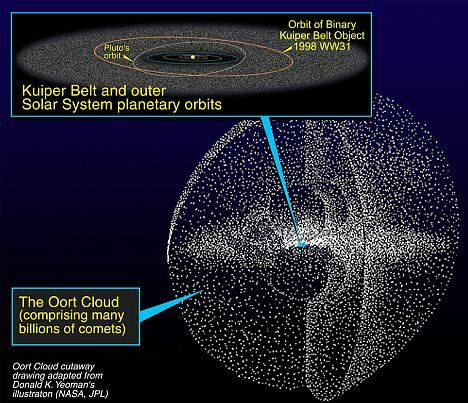 * I have to note that the Oort Cloud is the best made-up Star Wars name that actually isn't made-up or in Star Wars.